Chloroplast Confidences of Flooding Tolerant Tree Populations. Bygone Tales? The study of genetic relationships among southernmost populations of the tree species Calophyllum brasiliense could be indicating past connections between the Amazonic and the Atlantic forests through the Paraguay River as an alternative route to explain tropical species colonization in northeast Argentina and southeast Paraguay. South America is recognized by itstropical forest which represents animportant oxygen source and a suitable habitat for numerous animal species. 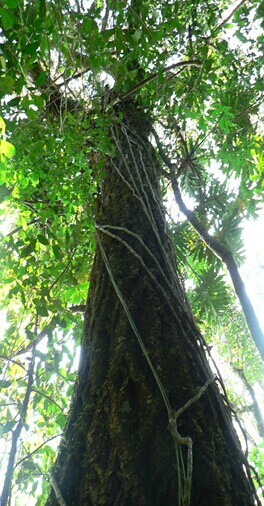 Within the Atlantic Forest several types ofvegetation can be identified as is the case ofhygrophyle forest with its specialized species. Among these species we foundCalophyllumbrasilienseCamb., a flooding tolerant tree that can reach 25 m highand is well adapted to grow in wetlands and borders of water courses.The species distribution was originally cited from South of Mexico to South of Braziluntil 2009, when Manuela Rodríguez and coworkers identified small populations of C.brasiliensein northeast Argentina extending the species distribution range.In thisregardthe elucidation of the origin of these southernmost remnant populations became the aimof a phylogeographic approach. Phylogeography consist in relating populations of a species through their genes and their geographic location to infer past demographic events. This information is very useful when designing conservation strategies of natural areas. A phylogeographic study of C. brasiliense populations leaded by Carina Argüelles included relictual populations recently found in Argentina and Paraguay in order to elucidate possible past routes that could explain the presence of C.brasiliensein northeastArgentina and southeastParaguay. The results obtained agreed with other studies in pointing Paraná River as the main colonization route through which C. brasiliense seeds were transported to this southern region of the species distribution. However the author Cecilia Percuoco,based on data from non-coding regions of the chloroplast DNA, suggested that the Paraguay River also could have been an alternative bridge that connected the Amazonia with the Atlantic Forest in this southernpoint of the species distribution. It is interesting how the author takes into account the regional geological historyand the implications that these events may have had on geographical distribution of the species populations. Why C. brasiliense is not present all alongthe Paraná River banks till the observed populations found in northeast Argentina? “The basaltic layer covering theParaná River bed didnot allow the seedsof C. brasilienseto be depositedorto colonize other places, until reach portions of the river with special features such as those displaying by the locationswhere C. brasiliensepopulations were recently described”_ explained the geologist Fernando Crivello_ who introduced this and other contributionsto the discussion issue. The conservation of C. brasiliense is important because the protection of these populations means to protect all the other species that inhabit hygrophyle forest. The ecosystem services that these forest offers are mainly related with a buffer role as regulator of water temperature and chemical compositions by acting as a biological filter throughtheroot networkthey generate. In addition several phytochemical compounds have recently been isolated demonstrating antiviral, antibacterial, antiparasitic and antileukemic activity. With respect to the conservation of these particular communities the phylogeographic study suggested that the area is a unit in terms of genetic management. In contrast, a previous work carried out by the same research group usingnuclear genetic markers discriminate two management units well differentiated. The difference is given in that the recent phylogeographic analysis employed chloroplastic regions which evolve slower than the nuclear genome, demonstrating the power of chloroplast information for historical approaches. Finally the author emphasized that as in the case of geological and historical events, otherexistingfactors thatplay a crucial role in modeling the genetic diversity (e.g. increased forest fragmentation, different soils and pollinators types or dispersal agents) should be consideredin order to achieve the best management plan. Dra. Cecilia B. Percuoco. CONICET Posdoctoral Fellowship. Instituto de Biología Subtropical Nodo Posadas, UNaM-CONICET. Misiones, Argentina. Research funding: PICTO UNaM 2011 N°0122 “Biología de la conservación de poblaciones fragmentadas de Calophyllum brasiliense Camb. (Calophyllaceae) en la región austral de su distribución” to Carina F.Argüelles. A paper about the study appeared recently in Journal of Plant Sciences.